If you're looking for some fun this summer, try heading to Millennium Park for Target's Family Fun Festival. You can find more details by clicking here. The last month has flown by! Here are a few last minute details. Tomorrow, Wednesday, June 11, is the students last full day of classes. They will have an end of year party in the afternoon, please send $3.00 for juice and pizza if you haven't already. They must wear their regular school uniforms Wednesday. Thursday, June 12, students are only to come for their own ceremony and they may wear dress up clothes. Uniforms are NOT required for the promotion ceremony. After the ceremony students DO NOT return to school on Friday, June 13. It's been an awesome year, have a safe and wonderful summer! We were just informed today that our Kindergarten Promotion reception will be held in the gym instead of in our classrooms. This means we will not need to limit who can attend with tickets. Seats will be first come, first serve. Our field trip to Brookfield Zoo is just around the corner. I sent home the chaperone letters today, so if you did not receive one, please see me on Monday. Unfortunately, I am unable to take everyone who wanted to volunteer this time. As we have seen our weather can vary drastically day to day, so please keep an eye on the weather for Wednesday and make sure your child is dressed appropriately and in uniform. Be prepared for rain or sun, as we will be going unless the weather is extreme. 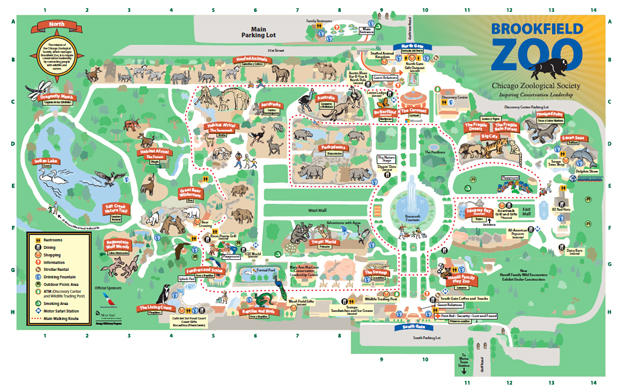 If you would like to take a look at the Zoo's map see below or for any other Zoo information, click the link here. Also, I have spoken to the children already about the fact that we are going to the zoo to see animals and we will not be stopping to play in the playground or go shopping while we are there. We do not have an unlimited amount of time and with eating and bathroom breaks, our time is even shorter. We really need to stay focused on why we are taking the trip. Although the weather is getting warmer, our classroom is often quite chilly. I am unable to adjust the temperature during the day so I am advising the students to keep a sweater with them in case they need it in class. Thank you. There have been quite a few questions so I am hoping to address them here for everyone. The Mother's Day Celebration is taking place in the main building after school. We were invited to perform for the first time this year. The even starts at about 4:30, but they children won't be performing until between 6 and 7. They do not have to wear their uniform, but I did ask that they not wear jeans. We will only be singing one short song. Attendance is not required, but I hope that enough students will come so that the audience will be able to hear them singing. Second, there was some confusion in the wording of the permission slip for the field trip, BOTH students AND chaperones need to pay the $3.00 fee to attend. So, if you would like to chaperone, please send $6.00. I will choose the chaperones from those who turned in both the money and permission slip. If I receive more than I am allowed to take, I will do a lottery to choose. Thank you for all your help in both of these matters. I want to say thank you to everyone for helping the students have a wonderful Science Showcase. All the kids did a wonderful job presenting to their classmates and the other classes enjoyed looking at what they had done. Our class also enjoyed seeing the work of other students. It went very well for everyone. In other news, the end of the school year is coming before we know it. These last few weeks will be spent wrapping up kindergarten and getting the students ready for the transition to first grade. We will be learning some end of the year songs, we will be taking our end of the year assessments, and we are also planning an end of the year field trip. More news will be coming soon! Hello, this is just a reminder to please work on your Science Showcase presentations over the break. Just a little practice every day will help your child to feel more comfortable talking in front of the class. Thanks and have a great break! This Friday is Jeans Day. Students may bring $1.00 and wear blue jeans and their regular uniform shirt to support the March of Dimes. Our class will be attending the book fair on Thursday, during their normal library period, NOT Monday as I originally thought. The cheapest books tend to be about $5.00. If you want your child to make a purchase, please send the money in an envelope with the student's name and the amount on it. I will collect the envelopes in the morning and give them to the children when they are leaving for the book fair. You can also attend the book fair with your child during Literacy Night on Wednesday, March 19, from 5-7 PM. Click here for Peck's website. You can find their website by clicking here. Check out what's going on in our classroom! We have a new project up! We are trying to get some new science books for the kids to use. Click here to check it out.